Last week my daughter proclaimed that we should have Banana Swirl for dessert. Typical of most preschooler conversations, I asked her what was in that dish. She then mentioned it was bananas and bread mixed together. Hmmm. It sounds like she just came up with another installment of what I’m going to call kid-inspired recipes. Much like my Pretzel Soup recipe, I decided to take this as more of a suggestion/starting point. 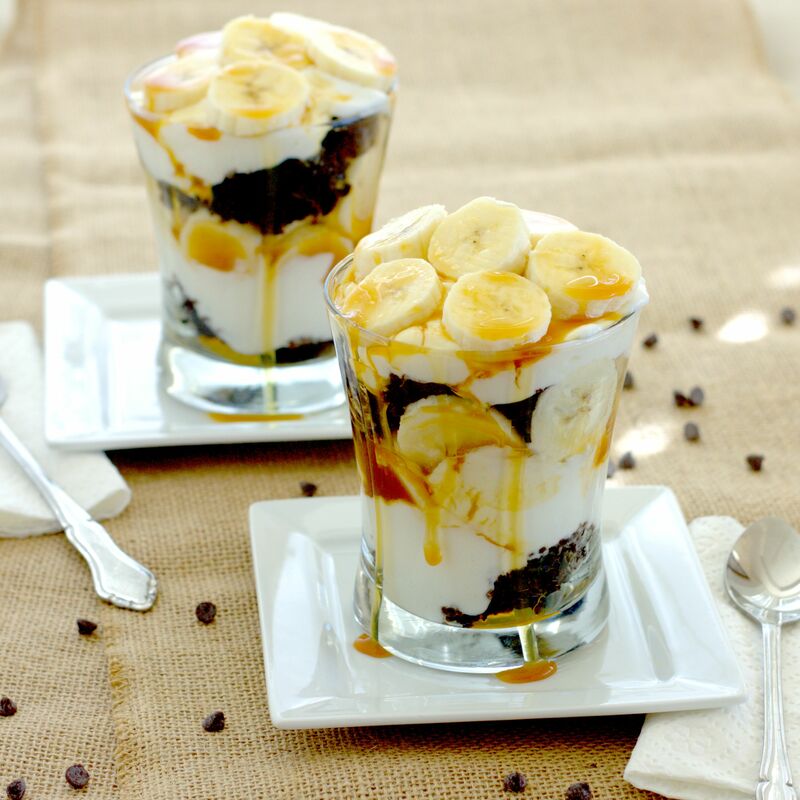 Instead of bread I used a chocolate-chocolate chip muffin to create a Chocolate-Banana Trifle or “Banana Swirl”. 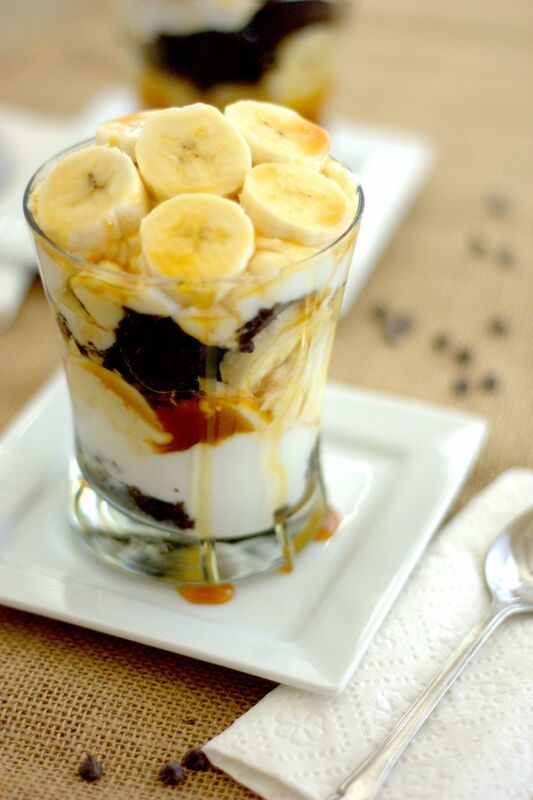 I layered muffin pieces with vanilla flavored Greek yogurt (I opted for a healthier layer rather than a more typical custard or whipped cream layer, though this dish still qualifies as an extra-special, sugar loaded treat), a bit of caramel topping, and slices of fresh banana. The result was an enticing trifle which in my mind straddles the breakfast and dessert categories. I know, I know, caramel for breakfast? Nonetheless, I’m still going to let you decide when you want to eat it! Tear the muffin into chunks and place half at the bottom of a parfait glass or an 8 ounce juice glass. 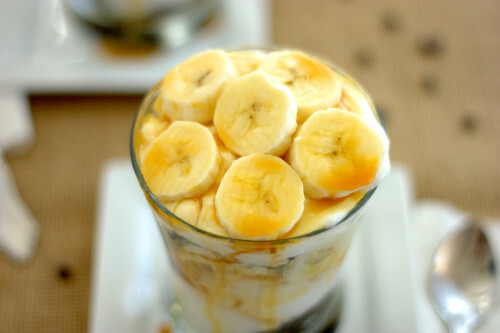 Add half of the yogurt, half of the banana slices, and then half of the caramel topping. Repeat layers with the remaining ingredients. Refrigerate until ready to serve. Makes 1 serving. 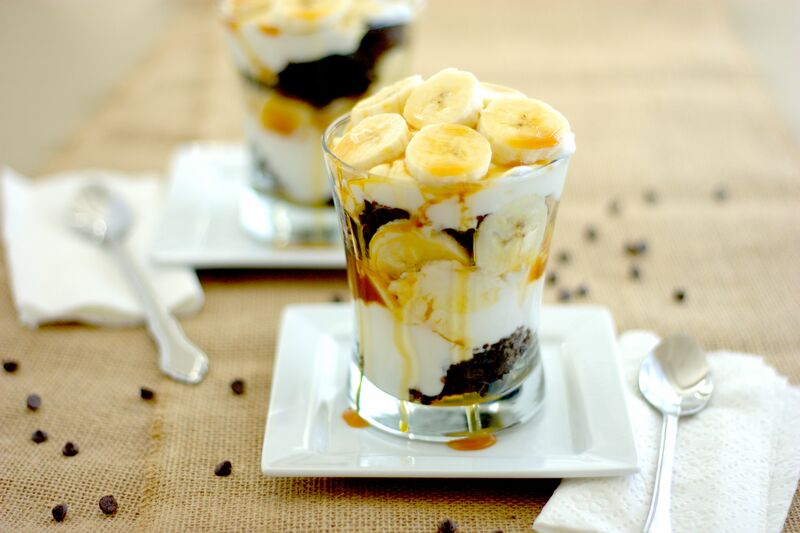 This entry was posted in Breakfast, Dessert and tagged banana, chocolate, kid-inspired, yogurt. Wow, those sure do look delicious! I’ll have to make those for the family!! !